The male pulled all the queen's wings off! 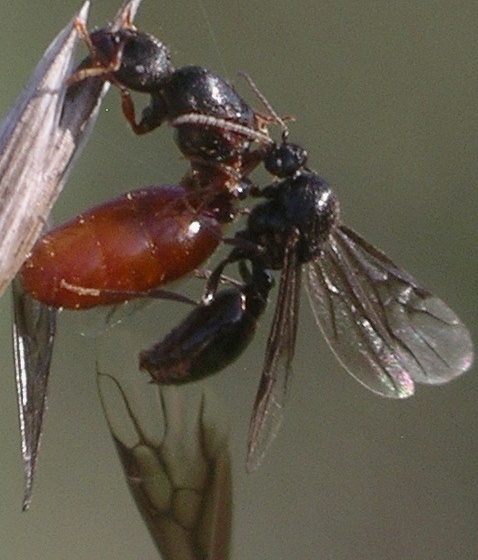 After that, both ants fell to the ground, with the male clinging to the wingless, heavier female. This species is definitely an intriguing one. First, I had always considered Carebara as an Old World genus. Second, I totally ignored some "dealating" males could exist at all among the Ants as a whole. A very effective way of making sure the female won't mate any more. The ant equivalent of the chastity belt! But as your series from this year indicate, other individuals are more tolerant.